Our free PDF Validator combines CommonLooks’s proven PDF technology and feature set into the perfect tool for testing and validating documents against the leading accessibility standards. Fast PDF Verification – Assured! 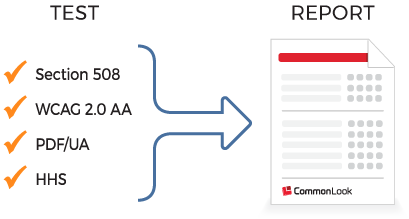 Unlike other PDF verification products, PDF Validator provides users with a certification report for each tested document. Communications and compliance specialists can rest assured that their PDFs are compliant with accessibility standards. With other verification products, it’s not uncommon that documents will pass the tests, but still not be accessible and compliant. They are great. No complaints. They are easy people with whom to work. PDF Validator is the most functionally rich PDF testing tool on the market today – and it’s completely free! Visit our CommonLook Validator Update News page.